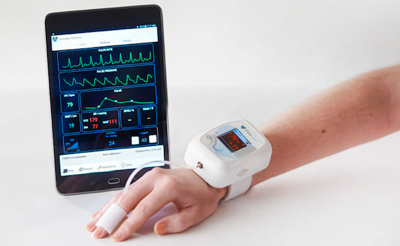 CareTaker Medical, a leader in wearable medical devices, has a crucial task – monitoring patient vital signs in real-time, continuously, safely and accurately within the hospital, during transport, and after patient discharge. It sought to provide the level of measurement precision previously only available in acute (inpatient) care settings. The company’s innovative finger cuff couples together two small arteries at the edge of the finger to monitor physiological parameters like heart rate and continuous beat-by-beat blood pressure. The wireless device allows clinicians to remotely monitor patients’ vitals through secure and HIPAA-compliant portals and systems. Because the devices are used by a range of clinicians and even patients themselves, it’s critical that the device’s fastening system could be easily secured – without the need for instruction or guidance – by anyone, even elderly patients with dexterity issues. Underscoring CareTaker’s product design is the need to enable mobility and simplicity while minimizing cost. During the product design process, CareTaker was grappling with how to attach its monitoring device to patients without interfering with device readings. In testing its finger cuff monitoring device, CareTaker medical encountered a significant hurdle. The cuff’s “bladder” component needed to be sensitive at low operating pressure but capable of inflating to high pressure. Through a series of trials, it was determined that to accomplish this balance, the contact surface had to be polyurethane exactly – and only – two thousands of an inch thick. The devices’ natural cycle of inflation and deflation could easily cause such a thin material to deform, however. Any permanent deformation would render the render the device ineffective. The device also required a stiff backing to maintain pressure inflation against the finger. CareTaker needed a lightweight cuff material that could insulate the device, be integrated into a one-size-fits-all solution, and be comfortable to wear for long periods of time. Ultimately, CareTaker turned to Velcro Companies to design a comfortable, custom solution that was robust enough to allow the very sensitive device to accurately measure patient vitals. Velcro Companies proposed using VELCRO® Brand ONE-WRAP® as the backing material for the cuff. ONE-WRAP® is extremely lightweight and also thick enough to maintain pressure inflation against a patient’s finger. Velcro Companies also designed a tab and slot feature that would allow medical practitioners to adjust the cuff to fit all patients, regardless of finger size. functional, and comfortable enough for patients to wear long-term (even while sleeping), allowing CareTaker to consistently monitor vital signs and keep patients safe.